The patent refers to "the sun, as well as other sources of radiant energy, like cosmic rays," that the device works at night is explained in terms of the night-time availability of cosmic rays. Tesla also refers to the ground as "a vast reservoir of electricity of negative charge". Tesla was fascinated by radiant energy and its free-energy possibilities. He called the Crooke's radiometer, a device which has vanes that spin in a vacuum when exposed to radiant energy "a beautiful invention." He believed that it would become possible to harness energy directly by "connecting to the very wheel-work of nature." On his 76th birthday at his yearly ritual press conference, Tesla announced a "cosmic-ray motor" when asked if it was more powerful than the Crooke's radiometer, he answered, "thousands of times more powerful." In 1901 Nikola Tesla was one the first to identify "radiant energy." Tesla says that the source of this energy is our Sun. He concluded that the Sun emits small particles, each carrying so small of a charge, that they move with great velocity, exceeding that of light. Tesla further states that these particles are the neutron particles. Tesla believed that these neutron particles were responsible for all radioactive reactions. Radiant matter is in tune with these neutron particles. Radiant matter is simply a re-transmitter of energy from one state to another. Stick an antenna up in the air, the higher the better, and wire it to one side of a capacitor, the other going to a good earth ground, and the potential difference will then charge the capacitor. Connect across the capacitor some sort of switching device so that it can be discharged at rhythmic intervals, and you have an oscillating electric output. Tesla's X-Ray tube, part of his method for utilizing "radiant energy," which operated from the top of a Tesla coil, providing a means to charge the "elevated insulated body of capacitance" C, with armatures T-T'. "Whenever the circuit is closed owing to the rotation of the terminal t', the stored energy is discharged"
"It is well known that certain radiations - such as those of ultra-violet light, cathodic, Roentgen rays, or the like - possess the property of charging and discharging conductors of electricity, the discharge being particularly noticeable when the conductor upon which the rays impinge is negatively electrified. "My own experiments and observations, however, lead me to conclusions more in accord with the theory heretofore advanced by me that sourced of such radiant energy throw off with great velocity minute particles of matter which are strongly electrified, and therefore capable of charging an electrical conductor, or even if not so may at any rate discharge an electrified conductor either by carrying off bodily its charge or otherwise". "When rays or radiations of the above kind are permitted to fall upon an insulated conducting body connected to one of the terminals of a condenser, while the other terminal of the same is made by independant means to receive or to carry away electricity, a current flows into the condenser so long as the insulated body is exposed to the rays, and under the conditions hereinafter specified an indefinite accumulation of electrical energy in the condenser takes place. This energy after a suitable time interval, during which the rays are allowed to act, may manifest itself in a powerful discharge, which may be utilized for the operation or control of mechanical or electrical devices or rendered useful in many other ways. "In applying my discovery I provide a condenser, preferably of consederableelectrostatic capacity, and connect one of its termansl to an insulated metal plate or other conducting body exposed to the rays or streams of radiant matter (Tesla makes a note about the construction of the condenser). The insulated plate or conducting body should present as large a surface as practicle to the rays or streams of matter, I having ascertained that the amount of energy conveyed to it per unit of time is under otherwise identical conditions proporionate to the area exposed, or nearly so. Furthermore, the surface should be clean and preferably highly polished or amalgamated. The second terminal or armature of the condenser may be connected to one of the poles of a battery or other source of electricity or to any conducting body or object whatever of such properties or so conditioned that by its means electricity of the required sign will be supplied to the terminal. 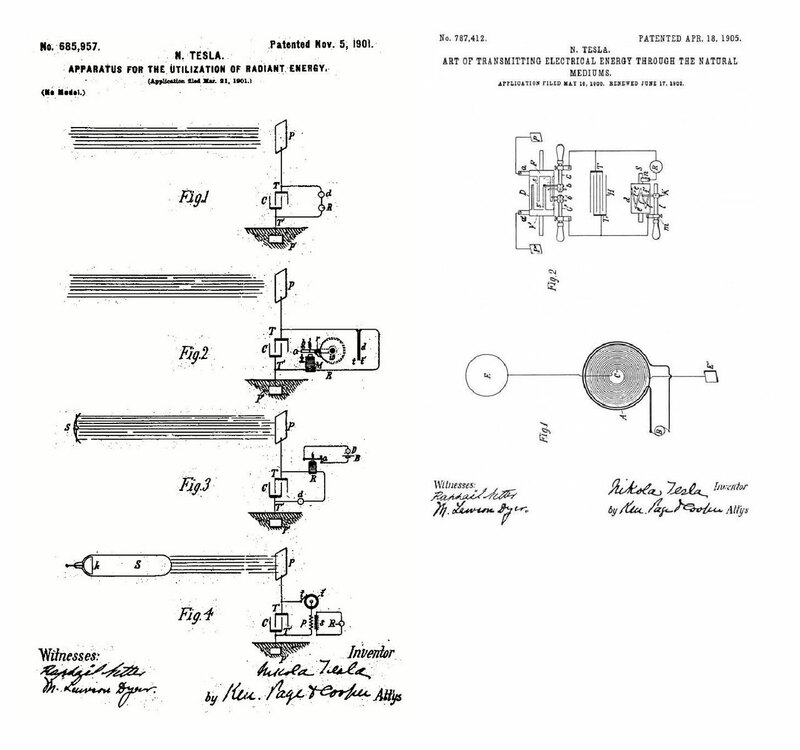 (Tesla notes using a grounded conductor for supplying electricity of negative charge) As the rays or supposed streams of matter generally convey a positive charge to the first condenser-terminal, which is connected to the plate or conductor above mentioned, I usually connect the second terminal of the condenser to the ground, this being the most convenient way of obtaining negative electricity, dispensing with the necessity of providing an artificial source. In order to utilize for any useful purpose the energy accumulated in the condenser, I furthermore connect to the terminals of the same a circuit including an instrument or apparatus which it is desired to operate and another instrument or device for alternately closing and opening the circuit". "The rays or radiations which are to be utilized for the operation of the apparatus above is described in general terms may be delivered from a natural source, as the sun, or may be artificially produced by such means, for example, as an arc-lamp, a Roentgen tube, and the like, and they may be employed for a great variety of useful purposes." Hermann Plauson, a director of the Fischer-Tropsch "Otto Traun Research Laboratories" in Hamburg, Germany, during the 1920s, worked largely on radiant energy and even made a few patents of his own. Mr Hermann Plauson advanced upon Mr Tesla's basic design and it would at least appear that he conducted extensive research into the field of radiant energy, Mr Plauson however termed it "atmospheric electric energy" () and noted it's similarity to static electricity but weather he actually knew of Mr Tesla's work or not, is unclear. His systems mainly involved needle & radium- coated electricity conducting balloons or aerostats which were connected to complex converting systems consisting of coils, capacitors, spark gaps etc. He developed an electrostatic generator called Plauson's converter. In 1920, Plauson published a research journal on the subject, titled "Production and Utilization of the Atmospheric Electricity" (Gr., Gewinnung und Verwertung der Atmosphärischen Elektrizität). A second, expanded edition of his journal was published later the same year. "When and where do you expect to make the official announcement of your new discoveries?" the inventor was asked. These discoveries," he replied, "did not come to me over night, but as the result of intense study and experimentation for nearly thirty-six years. I am naturally anxious to give the facts to the world as soon as possible, but I also wish to present them in a finished form. That may take a few months or a few years. I have disintegrated atoms in my experiments with a high potential vacuum tube I brought out in 1896, which I consider one of my best inventions. I have operated it with pressures ranging from 4,000,000 to 18,000,000 volts. More recently I have designed an apparatus for 50,000,000 volts which should produce many results of great scientific importance. I have satisfied myself that the rays are not generated by the formation of new matter in space, a process which would be like water running up hill. According to my observations, they come from all the suns of the universe and in such abundance that the part contributed by our own sun is very insignificant by percentage. Some of these rays are of such terrific power that they can traverse through thousands of miles of solid matter". "I can now state that I have succeeded in operating a motive device by means of (cosmic rays). I will tell you in the most general way, the cosmic ray ionizes the air, setting free many charges (ions and electrons). These charges are captured in a condenser which is made to discharge through the circuit of the motor."